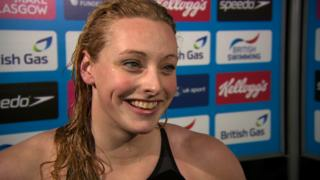 Rachael Kelly is a surprise winner of the 100m butterfly title at the British Swimming Championships in Glasgow. Kelly, 20, saw off the challenge of established international swimmers Siobhan-Marie O'Connor and Francesca Halsall to win in 58.40 seconds. The British Championships are the final opportunity for swimmers to secure their place at this summer's Commonwealth Games.